I have more of an interest in all the kerfuffle leading up to the election than the actual election itself... which is either a sad reflection on political apathy, or of my love of markets and probabilities. I'm not sure which. That aside, the game of trying to figure out what will happen in the next election is a fascinating one from the point of view of a market watcher. London related shares moved when Labour announced their proposals around res non-doms (a nice tax structure for wealthy 'foreigners', basically), which investors saw as a threat to the status quo at the top end of the London market. The journalists also have a field day, since it gives them a nice event they can attribute market movements to - 'the FTSE dropped 20 points as fears of a Labour-led Government grew..' and the like. I was browsing Stockopedia the other day and came across an article on Next. I like Next - it's a clear success story and an excellent company. Aside from the interesting article itself, there was also a fascinating comment about the quality of the team and processes at Next, with evidence taken from their Annual Report. I've never actually taken the time to read one of their annual reports - which is a failing of mine, as I think you get a lot from reading the annual reports of demonstrably successful companies. It's subject to a lot of hindsight bias, of course, but given how many annual reports of pretty poor companies a value investor will usually end up reading, there might be something of a benefit in a 'compare-and-contrast'! The explanation itself is pretty elementary - it's just a simple observation that you have alternative uses for your cash, and optimising shareholder returns is always about using your cash in the best way. There's lots that can be added to the above analysis, and criticisms you can level at it, too - notably that Next is a company with such great returns on tangible capital that, in reality, share buybacks are significantly worse than organic growth. On that front, actions speak louder than words - buybacks have been fairly restrained, and investment in organic growth has been substantial, accretive, and careful enough that (unlike so many) growth has been executed consistently and without the usual bloating of central costs, diminishing returns on marginal capital and general organisational 'fatigue' that you see so much elsewhere. But aside from that - even aside from the fact that Next have successfully executed their buyback plan to the great enrichment of long-term shareholders - there's an even more fundamental point that comes to mind. I think you significantly beat the market over a 5-10 year period if, with absolutely no other criteria, you just invest in companies which actually talk about the benefits and reasoning behind good capital allocation. 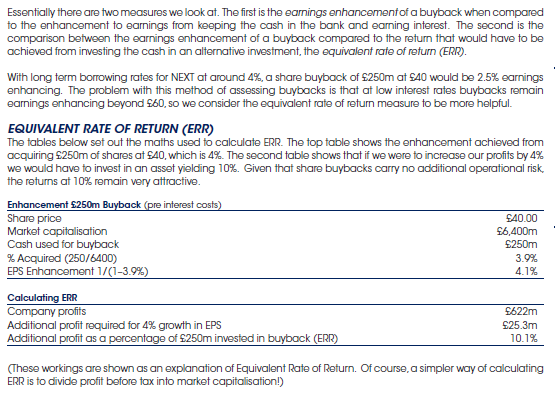 It's deeply worrying how few companies either acknowledge or consider the possibility of share buybacks, or actually spend any time talking about logical investment planning in acquisitions, with respect to return on investment and what else they could do with the money. One piece of logic; (which seems scarily prevalent in US companies) that any acquisition which is earnings accretive must automatically be a good thing, is so ridiculous it doesn't even bear considering. Some of these discrepancies doubtless come about from the principal-agent problem; the fact that CEOs have a much more vested interest in enriching their personal domain and building their legacy than conservatively maximising long-term returns. My little suspicion - that management teams which talk about capital allocation deliver better returns - is interesting from the perspective that it might not even need good capital management to be true. I suspect that simply the fact that management acknowledge its importance is well correlated with management being switched on and alert in other respects. The argument is more or less unprovable, I guess, and again I note that it is subject to a great deal of survivorship and hindsight bias. It's easy to pick up an annual report of Next, a great company, and then essentially 'data mine' for variables which you then suppose are positively correlated with that success. Still, it's my hunch. Good capital allocation is much, much rarer than I would hope, and I think that makes it a particularly valuable asset. Active management is bad because it's difficult to spot profit warnings coming, and difficult to discern future profitability. It is better to base investment decisions on a 'fundamental measure, like dividends'. ... if you haven't been keeping up with Quindell, some might say you're missing out - it sort of depends how you get your kicks in life. It is rare you get to see such a public back and forth between the long and the short side of a stock; usually those bearish stay out and stay quiet, but in Quindell's case you have a fistful of public legal spats, accusations of impropriety and the usual festival of characters wading in on either side of the debate.